For years I have been fascinated by PING irons. A few years back I hit some G5 irons during a demo day and just could not get over the fact that everything was bombed high and straight. I hit the i5 irons as well, and while not quite as forgiving, I really felt like the added forgiveness over the irons I had been playing would be a welcomed addition to my game. Alas, I ended up sticking with what I had, and well, with all the equipment reviews around here my bag is generally a revolving door. The PING G10 and i10 irons and were well received for the most part. The G10 irons continued to improve the game improvement line, while the i10s seemed to take a step closer to the S57/S58 player line of clubs. Some players of the i5 were put off by that, some seemed to embrace it. 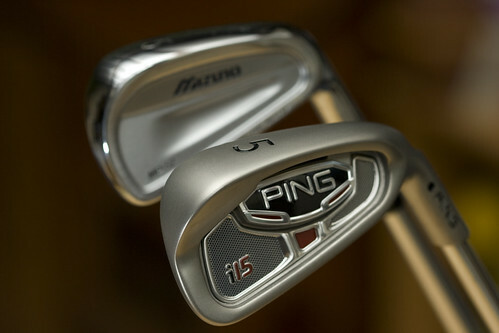 Now, in 2009, PING has released the 15 line of clubs, including new i15 and G15 irons. 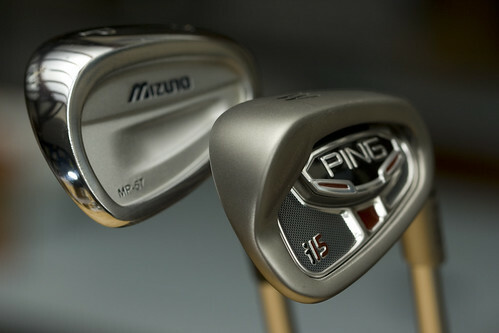 It seems PING has listened to the feedback from their loyal customers and made some welcomed changes to the i15 line. 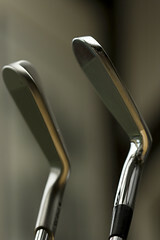 Today we will have a closer look at the i15 irons. Over the next few weeks we will also be having a look at some of the other clubs in this new 15 line. 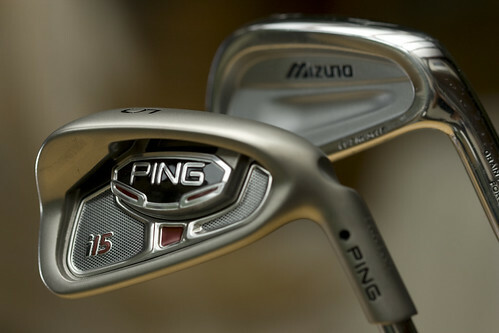 Throughout the review you will see some pictures of the PING i15 irons alongside pictures of Mizuno MP-57 irons, which are targeted at a similar level of player. As always, we will start with a little information from PING then on to the detailed review. In the design of the i15 iron, PING engineers focused on the better player who prefers an iron set that offers the control to play a variety of shots. 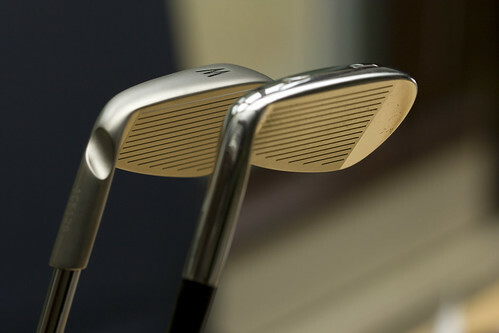 Created as a progressive set, the longer irons are larger for more forgiveness. The mid- and short-irons are smaller to ensure workability and control on approach shots. The stainless steel iron features a tungsten toe insert to add forgiveness to the mid-size design. A stabilizing bar and new Custom Tuning Port (CTP) provides the feel and sound attributes preferred by better players. The following table details the club specifications of the PING i15 irons. 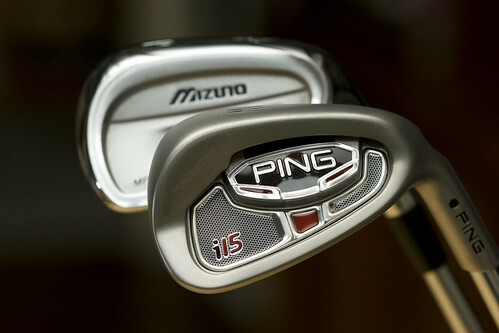 The PING i15 irons feature a relatively compact face size. As you can see in some of the pictures in this review, they are pretty similar to that of the Mizuno MP-57 or Adams Idea Pro Gold irons. They are, however, slightly larger than the previous generation i10 irons. While the backside may look a little busy to the golf purist, at address the irons setup real clean. The top line is relatively thin for an iron with this much forgiveness and the offset in the shorter irons is pretty minimal. When you get up to the 3/4/5 iron, the offset is a little more prominent and the top line is a little more noticeable, but nothing overly distracting. They have designed the clubs this way, where the offset and club head size gets progressively larger as you get up to those long irons. Feel wise, I would not put these in the same class as a forged iron like the Mizuno MP line or even the Adams Idea Pro Gold irons. However, as with most things, there are always trade-offs. We are giving up a little in that feel department to gain a little in the forgiveness realm. All that being said, by no means are these dead shovels. I always knew where on the face I had hit the ball and I find that level of feedback to be critical to my game, especially while practicing. It was just on the sweet spot shots that I felt like I lost a little of that buttery smooth forged iron feel. Nonetheless, hitting an i15 3 iron on the center of the face, and watching it rocket down the center of the fairway is pretty awesome. They are also actually quite nice feeling on chip shots. I spent a good amount of time hitting 8/9/PW bump and run shots and really liked the feel there. The long irons in this set are rock solid. Featuring that slightly thicker top line, slightly bigger offset and slightly larger club face, really add a lot of forgiveness and confidence to your long iron game. In the past a lot of players using a set of irons like the PING i15 series may have been inclined to replace the 3/4/5 irons with hybrids or the G series equivalent. This shift to make the long irons more forgiving, easier to hit, and higher launching make the decision to replace those clubs with an alternative a little difficult. You will certainly want to spend some time at the range comparing your 3 hybrid or 3 iron from the G series verse the performance of the 3 iron from the i15 series. I would probably stick with the 3 hybrid simply because I am just so in love with mine, but the 4 iron is a toss up at this point, and the 5 iron will definitely remain in the bag. These clubs really get the ball up in the air with the stock AWT shafts. Everything from the 3 iron through the PW, full swing for me results in a very high launch and soft landing shots. That certainly could be a combination of the lower center of gravity of these irons and the flight characteristics of the AWT shaft. I would suspect one could flatten out the trajectory some with a custom fit shaft. I have been playing Project-X shafts in most of my irons recent, so I am accustomed to that flatter trajectory. That being said, it is certainly possible to hit knockdown shots with these clubs and lower the overall flight. I hit a few nice knockdown 7 irons out from under trees that flew just as I expected hoped? Distance and off center performance, while still being very playable is where these irons really shine. I found these irons to be a good club longer than either the Mizuno MP-57 or Adams Idea Pro Gold irons. Not only were they a club longer, but they were extremely consistent when it came to distance control. Often times when you move up to a more forgiving, game improvement iron, you lose some of that consistency (one shot goes 150, one goes 155, etc). These are most certainly targeted at the consistency needs of a lower handicap player. While the i15s may not be in the same class as the G15 irons in terms of pure forgiveness, they are several steps ahead of the irons I mentioned earlier. When I first received the i15s, I headed right to my home course, walked out on the first tee without even hitting them on the range. 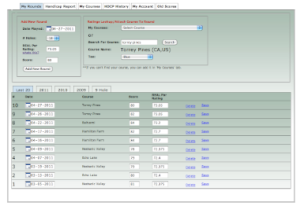 After adjusting to the added distance, I settled into a decent ball striking day. The 18th hole on my home course is a 180 yard par 3, over a lake to a small green. I put a pretty sloppy swing on the ball, and caught the ball a little thin and out toward the toe (speaks to the feel of these clubs). My first thought was water, because if I hit a shot like that with the Idea Pro Golds I had been playing, it would have been in the water. But, much to my surprise, the ball managed to carry the water and end up only about 10-15 yards short of where a well struck ball would have landed. Color me impressed, real impressed. If that wasn’t enough, after a few more rounds with these clubs and some driving range sessions, I played in a Member-Guest and decided to use the i15s. I ended up winning the closest to the hole with a well struck 9 iron. Sweet! The last thing I will mention about the i15s is something I have seen a number of people complain about. The grooves. The i15s conform to the new 2010 groove rules so they are USGA competition ready for events on the PGA Tour. What does that mean for the average golfer? Honestly, probably nothing. Most people do not generate enough club head speed, or make the contact necessary to take advantage of those deep cut grooves in most irons. I had no problem getting 8 or 9 irons to stick from the fairway, even sucked back a few pitching wedge shots. Now, out of the rough? Yeah, the ball is going to lose some of that back spin, but to be honest, I never generated much, if any spin out of the rough even with the pre-rule change groves. Anyway, I do not think it is a big deal, but some might, so keep that in mind. The only thing that prevents me from completely loving the i15 irons is the cast vs forged feel. That, however, is a personal preference, some people actually prefer the feel of a cast club. Performance wise, these clubs are rock solid and I could certainly see myself playing them They are quite forgiving, are very accurate when it comes to distance control, and I found them to have a very nice feel on chip shots. I had no problem hitting nice high draws or hitting knockdowns under the early fall winds here in the North East. Overall I would say if you are a mid to low handicapper, and are in the market for new clubs, these must be on your list of clubs to demo. The PING i15 irons retail for $799 fit with the AWT shafts. Purchasing them through an authorized PING retailer is generally your best option, especially if you can do it through a PING club fitter. PING has always done a wonderful job of making sure that players of their irons are fit to the proper equipment, whether that means finding the right shaft, lie angles, down to even the grip size. If you are comfortable with your specifications and do not mind taking a bit of a risk, you could save a few bucks on a used set on eBay, but at this point the prices are still quite high, so it may not be worth it. Keep your eye open for reviews of the G15 Hybrid and G15 Driver coming soon! As with most of our reviews here, Ping has provided the i15 Irons used in this review free of charge. As we receive equipment from all of the major golf equipment manufacturers, we try to remain unbiased and provide an honest look at every piece of equipment we review at The Deep Rough, this is nothing new. We would have a much harder time putting together all of these reviews if the manufacturers if we had to go out and purchase all of this equipment at retail prices. And for full disclosure, just about every piece of equipment we receive for a review we end up giving away to charity or as prizes in contests. Though, I suspect I will be keeping these i15s in my bag for a little while! How to Save Money on Irons - Buy Used! Great review, Sean. I am looking into new irons, so this was a pretty helpful look at Ping’s set. Thank you. A very informative review, well covered in all areas and remaining interesting throughout. I’ll be searching through the Deep Rough vaults to make my decisions for my next set over the coming months. No problem Nick, let me know if you have any questions about other equipment reviews. In the process of looking at the G15 irons right now. Lots of info in your review Sean, However, I play with the i10′s, and am a bit confused. Always looking for something to improve my game, would I be better off sticking with my i10′s, or buying a new set of i15′s, is there that much difference in the two, or would I be changing them just for cosmetic reasons. I play off 13 handicap. I only ever hit the i10s at the range a few times. However, from what I can tell, and from what other i10 players have told me, the i15s shift a little closer to the game improvement side. Where as the i10s shifted more toward the control/playability side of things. 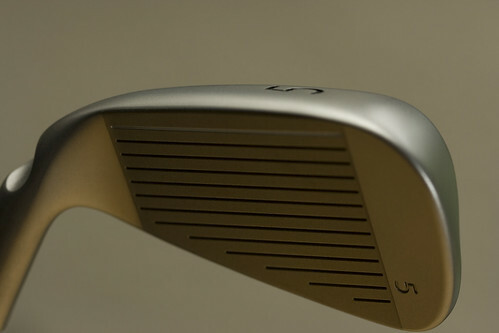 So, if you’re looking for a little more forgiveness in your game…by all means, check out the i15s. But if you’re comfortable with your misses now, stick with what you’ve got. Sean, thank you for the thoughtful review. I am seriously looking at going to the I 15. My question is about the 2010 tour ready grooves. 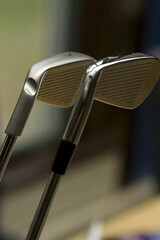 Have most of the 2010 model mid to higher line irons (A2, TP ect.) gone to the new grooves? Was hoping to wait a few years before having to give up some of that playability. I’m a 2 to 3 index, and a little concerned about the implications of the groove changes. It’s not like I am top amateur or tour type player. Any thoughts? Is it worth tracking down a 2009 model of the I 15? I myself got the i15s for Christmas putting up a set of Callaway Big Berthas, I went through about all of the new 09 releases and was heart set on the i15s, the amount of control and forgiveness you get is simply amazing. I went from shooting far and uncontrollably to almost exactly where i wanted and with the most control a golf club could offer. These are definitely the clubs for someone wanting to step up and take their game to the next level. @GK I could be wrong, but I believe all of the I15s have the 2010 grooves. I did not notice a huge difference. However, if your game relies on generating a lot of spin out of the rough, then maybe you should stick with the pre 2010 rule grove irons. See if you can find a set of Mizuno MP-57s, they are similar in terms of forgiveness/playability, but have the 2009 grooves. @Brandt – agreed! Glad you love them! I liked my I3 Customs. I did not like my S59s. I love my MP 57s and I am sold on forged. Man what have I missed. 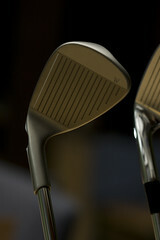 I just ordered the i15 yesterday and can’t wait for their arrival…I played my father’s I10s and really liked the feel. I was playing the Bridgestone J36 combo irons before and really like the progressive irons. I found the Bridgestones a bit too “player” for me so the added forgiveness of the I15 will be a welcome addition. I loved them on the range. Thanks for the review. I am currently playing with Ping !3plus and I am in the market for new clubs. how much improvement are the I15 ober the I3puls? Reginald, I have never played the i3+ irons, so I cannot answer that question. I do still have the i15s in the bag and still stick to my thoughts from the original review. Great sticks, very forgiving, workable, decent feel. I had a run with the g15s for a while, which felt a little like shovels after bagging the i15s. I would check them out at your local Ping authorized dealer, see how they feel in your hands. them in 3 or 4 days. Hit a set of i15s today. WOW!!! never hit wit a ping club before today but when I was sending the 9 iron 172 yds (thats almost 16yds better than the best hit on my set of nike’s and better than 20 yds better than my precepts) all I could say is DADDY LIKE…..DADDY WANT! Thank you for a great review. I just ordered my i15 irons yesterday and am very anxious for their arrival. I am concerned about the silver color code which I was fitted to. I was able to hit a 7 iron silver before I ordered and your comments described my experience. The 7 was straight, 10 yards longer and easy to work right or left. Your reuse gives me confidence that I have made the right decision. Love the i15′s… P-3. I’ve learned to work the ball left or right, hit my long irons with way more confidence and great results. My irons are the worst part of my game but its gotten much much better. I’m truly seeking pins now rather than just trying to hit the green. I’ve dropped about 8 strokes this past year and am now a 10.03 hc. I’ve spent a great deal of time on the range working/learning these irons and I’m hooked again, even after 20+ years.